We’re excited to finally release the version 2 update to GTmetrix! Updating the look of GTmetrix was the main focus of this update. Our original site design had a width of 960px – now we’ve increased the width of our layout to take advantage of the wider displays available. We’ve flattened things out and focused on a cleaner look. In addition, we’ve added some visual icons to help with feature and option recognition. 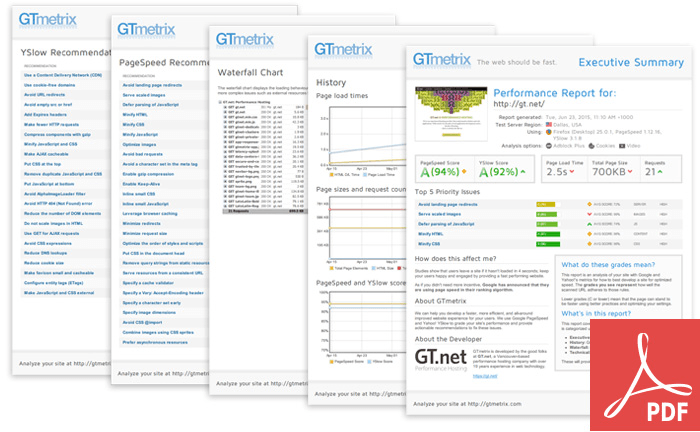 Say hello to a newer, brighter GTmetrix! Colors are brightened and high contrast buttons emphasize important actions. All our icons and graphics have been converted to SVG, ensuring great looking visuals at any size. GTmetrix now uses Scalable Vector Graphics! GTmetrix is now fully responsive! This was quite difficult given all the data GTmetrix generates, but we managed to deliver the core functionality of GTmetrix even at smaller screen sizes. We focused on fluid design as well, maximizing the use of screen real estate as much as possible. 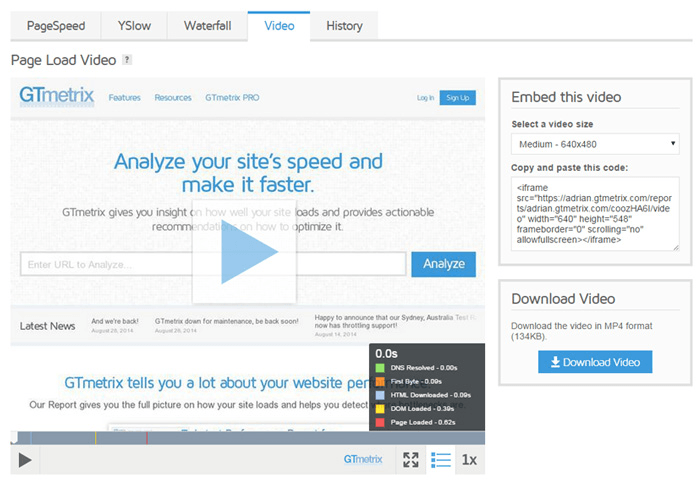 Analyze your website’s performance from any device at any screen size. Some data and functionality will be limited at the reduced display sizes. Features like History graphs, Waterfall graphs and others simply won’t be functional at a small screen size, so either switch your device to landscape mode or have a look at the report on a full desktop screen. More advanced features are available only at larger screen sizes. 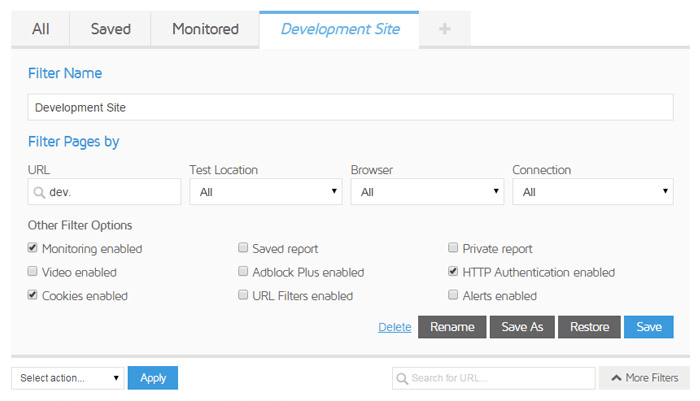 We moved a few features and common actions into their own dedicated sections for higher visibility. In our survey, we discovered that a lot of our users were unaware of the additional features GTmetrix had to offer, so we took them out of the general “Page Settings” screen and gave them their own space. We switched from lightboxes to a sliding sidedrawer for all Page Settings and options. This change will make navigating settings and options a lot more streamlined – especially down to mobile device sizes. Page Settings and options all live in the sidebar now. GTmetrix version 2 is primarily a visual update, however we were able to implement some new features and updates to make GTmetrix more usable. Now you can easily find your reports with filters and instant search. We’ve also added sorting, paging and “Show Amount” options to help accounts with numerous reports (30+) find what they need more efficiently. Search for reports based on filters you define. This new filter functionality also lets you create custom search filters. Use keywords and/or options to define the reports you want ot see, then save the filters into their own tab. You’ll readily have your filters available for faster reference. 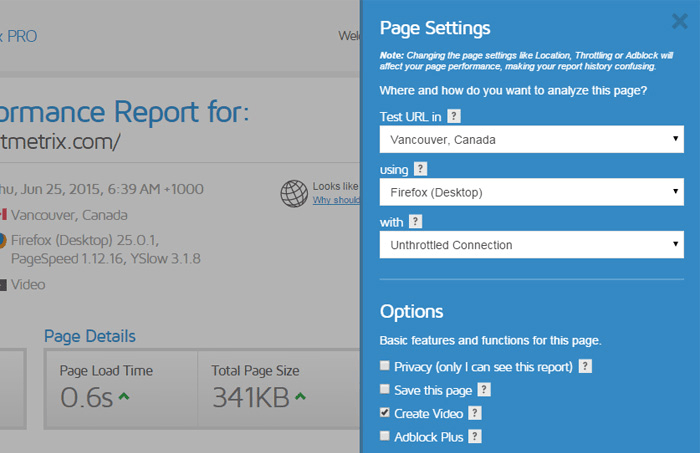 Create your custom search filter for fast report results. We’ve made some general improvements to our PDF reports, including updating the look and feel to the new GTmetrix version 2 design, and implementing better logo handling for our white-label GTmetrix PRO users (better scaling, transparency enabled). To ensure the security of our users we’ve pushed everything to SSL. Give GTmetrix version 2.0 a try today! 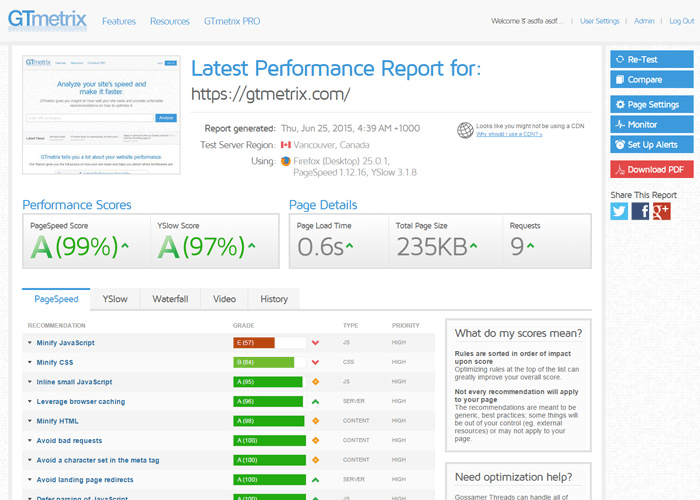 We’ve put a lot of work into making GTmetrix better and with your feedback, we hope this iteration makes optimizing your websites easier and more efficient! Let us know if you run across any bugs or issues and feel free to tell us your thoughts on twitter (@gtmetrix) or contact us.